This Bluetooth temperature probe babysits the food so you don't have to, alerting you via smartphone at just the right time. Barbecuing would be so much more enjoyable if the results were more predictable, right? Whether you’re using propane, mesquite charcoal, or hickory wood, it can be tough to keep the temperature just right. And the fact that different foods require varying degrees of doneness complicates the issue even further. You can get away with undercooking a good steak or high-quality ground-beef patty, but you do that with pork or chicken at your peril. Now that I’ve grilled a few times with iDevices’ iGrill Mini, I can’t imagine cooking outdoors without it. The iGrill Mini communicates with your smartphone or tablet via Bluetooth (iGrill says it has a range of 150 feet). Plug one end of its temperature probe into the iGrill and plunge the other into whatever you’re putting on the grill, call up a recipe on your device, and the app will alert you the instant your food reaches the internal temperature called for in the recipe. It’s that easy. The iGrill Mini takes the guesswork out of barbecuing. 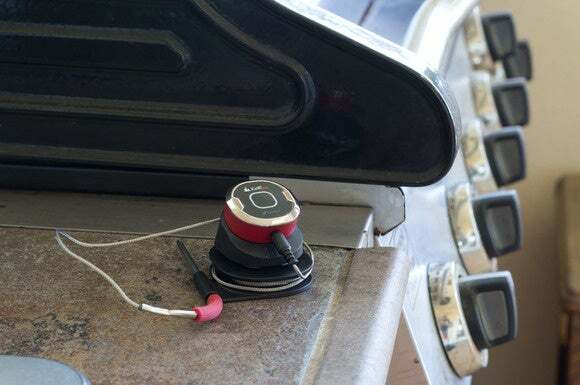 Peel the adhesive off the provided magnet, and you can mount the coin-cell-battery-operated iGrill Mini to your barbecue or any other surface (don’t put it where heat will melt the adhesive, obviously). 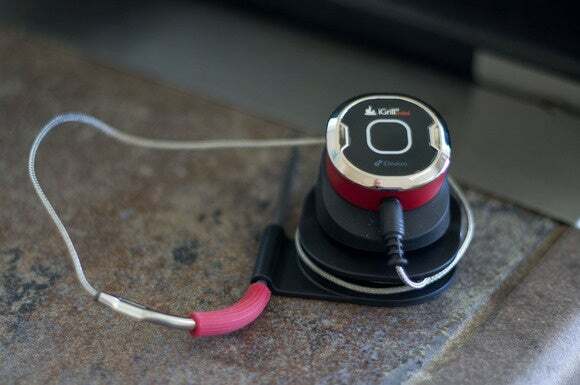 The probe connects to the iGrill with a 48-inch armored cable and it has an insulated rubber grip, but use caution when handling the probe as it still gets very hot. Once you’ve paired the iGrill to your Bluetooth device, a green LED square lights to let you know it’s communicating with the app (I used an Android smartphone, but there’s an iOS version of the app, too). The larger iGrill 2 is can monitor up to four probes and display the temperature on its face, but it’s priced at $100, where the model reviewed here costs just $40. The $40 iGrill Mini should meet most people's barbecue needs. The iGrill app has temperature presets for various cuts of beef, lamb, and pork; several classes of poultry, including game fowl; and six types of fish. 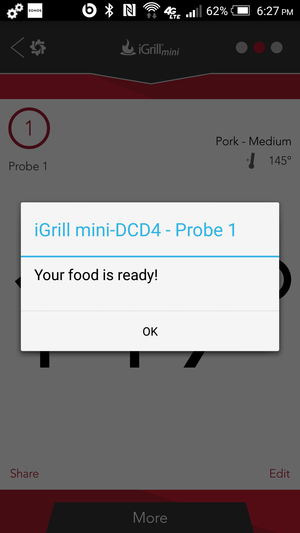 Choose the cut you plan to barbecue, select the degree of doneness you seek, and the app will monitor the probe until it registers the desired internal temperature. At that point, it will produce an alert to let you know your food is ready. The probe will send a message to your smartphone the instant your food reaches the desired internal temperature. For some foods, such as chicken, there’s just one target temp, because that’s when that food is safe to consume. But for steaks, you can choose rare, medium rare, medium, medium well done, and well done. The app identifies USDA-recommended cooking temperatures, too. Once you’ve selected a target temperature, you can let friends and family know what you’re up to with a post to your social networks of choice, including Facebook, Twitter, and Pinterest. You can also send emails and text messages right from within the app. 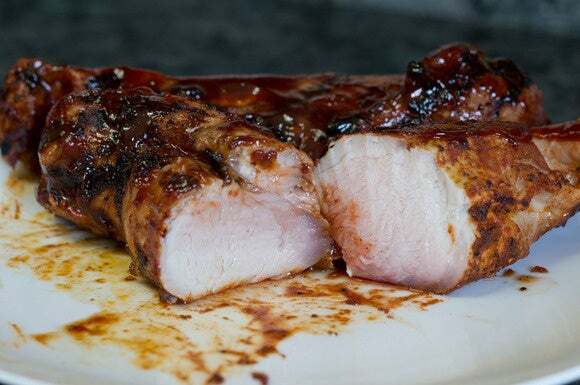 The app comes with five sets of recipes, one from iGrill itself and four from partner companies (Omaha Steaks, Jennie-O turkey, Pitmasters, and Panna Foods), but the recipes aren’t tied to the probe itself. That means the app won’t send you an alert when that temperature is reached unless you manually create an entry for that target temp. No doubt some barbecue purists will blanch at the notion of piercing the meat they’re cooking, particularly a premium steak, but I experienced no ill effect from it. The meat didn’t dry out at all; in fact, each of the cuts I tried (a USDA Prime ribeye steak, a fresh chicken breast, a hamburger, and a pork tenderloin) came out juicier and more flavorful than I’d ever experienced because they were cooked to precisely the right temperature without my needing to babysit them. I love barbecuing, but I also enjoy drinking a frosty beverage, chatting with family and friends, and listening to music while I cook. The iGrill lets me do that without costing an arm and a leg.